This extract from Anne Brogden’s history of her family is reproduced with many thanks. Thomas jun., Eleanor and their three sons, aged 10, 9 and 6, left London for Lincoln in about 1824 for an unknown reason. Thomas's occupations at the births of his sons were 'dyer' in 1814, 'factor' in 1816, and 'victualler'' in 1818 so probably he could turn his hand to anything. Unfortunately I cannot locate where the family lived in Lincoln but, in Thomas John Nathaniel's (hereafter referred to T.J.N.) obituary of 1880, he is stated as having gone to the National School in Silver Street, 'in which institution he afterwards filled the position of usher.' Usher' is an obsolete term for a school teacher. In White's 1856 Lincolnshire there is this description:- 'Lincoln Central National Schools, in Silver St. were established in 1813, and are now attended by about 100 boys and 60 girls, who pay small weekly sums to a clothing club, from which they receive clothes at Christmas. The Bishop is the patron, and the Revs J.Thorold and W.F.F.Kave Secretaries'. The 1841 Pigot's Directory states that the 'National School, 9 Silver Street, Robert Hardman master, Elizabeth Reeve mistress'. The school must have given have T.J.N. a good education, and combined with his undoubted abilities, he went from strength to strength taking a prominent part in public life. On 1,5th October 1836 in St Martin's church he married Christiana Else, born in Nottingham, and baptised at St Nicholas' on 1st January 1812. She was the daughter of Francis and Sarah Else. It is interesting to speculate why she was in Lincoln, possibly she taught at the Silver Street school? My great-grandfather, John Ellett, was born on 1s1 August 1837, and his brother, Thomas Francis William in 3 839, but died 18 months later of typhus fever, on 13th December 1840. In 1841 Pigot's Directory states that, under 'Booksellers and Stationers' brother diaries is in Castle Hill, while, under 'Newspapers - Standard (Wed) office' is T.J.N.B. prop., also in Castle Hill. On Tuesday, November 1, 1836 issue no l, Vol 1 of The Lincoln Standard and Louth, Boston, Wisbeach, Newark, Peterborough, Grantham, Stamford, Gainsborough, Epworth, Isle of Axholrne, and Spilby Advertiser was printed by T.J.N.B. Obviously this was his honeymoon project! But in the 1841 Census, in the parish of St Mary Magdalen, at 36, Steep Hill we find the Brogden family, which now consists of T.J.N.B., aged 25, now a reporter, and his wife Christiana, also 25, (actually 29), with their son, John Ellett, aged 3. With them is brother Charles, aged 20 (actually 23), a printer, along with three printer's apprentices. One 15 year old female servant coped with the work. By 1843, in Robson's London Directory, there is the entry:- 'Brogden T.J.N. printer, bookseller and stationer at 263 Strand' (now demolished to make way for The Aldwich), and, in the same year, the brothers were at 36 Steep Hill, but by 1849 T.J.N., according to Kelly's Directory, was established at 24 Silver Street, Lincoln as 'Auctioneer, valuer, printer, house and estate agent, newsagent, and agent to the Atlas fire and life insurance company,' As, in the I9"1 century, the working classes rented their houses and there were few house sales, he had to have many strings to his bow. T.J.N. had been engaged in forcibly 'releasing' .public footpaths which property developers had blocked up, particularly a number of footpaths in Lincoln which had suffered this fate, largely because of the arrival of the railway. For example the Great Northern Railway had blocked the footpath on the south side of Brayford Pool. The Corporation as a body were opposed to this kind of thing and several individual members, including T.J.N., went out with saws and axes to break down the barriers obstructing the public right of way. He also protested vehemently against a Corporation plan to build markets, which would mean the disappearance of street stalls, but he was strongly in favour of the council embarking on an underground sewage system which would cost £30,000 - a rate of eight and a halfpence in the £ for 30 years. In the Guildhall he spoke volubly on both matters, as he did on a proposal, put forward by one of the city's MPs Mr J. Hinde Palmer, that a public library should be built. The 1851 census states that, at 24 Silver Street, Thos J.N., aged 36, lived with his wife, Christiana, aged 39, and their children, John E,, aged 13(sic), Sarah E., aged 9. Thomas W., aged 7, Christiana E., aged 3, and Francis E., 7 months. They now had two female servants, aged 25 and 19. By 1861 their family was complete. The two younger children, Elizabeth S. was now 8 years, and Frederick C. 5 years. They still had two female, though different, servants. By now the eldest son, John Ellett, was also a printer and bookseller, and they all were living at Palfrey House, Palfrey place just off Silver Street, but father and son were working from 24 Silver Street. We cannot locate them in the 1871 census, and by 1881 both of them would be dead. T.J.N. sold Palfrey House to the Co-op and built the house in Lincoln Terrace, plus another to rent out. T.J.N. was a Governor of Christ's Hospital; and Chairman of the Lincoln Gas Company. He was also twice Mayor of Lincoln, first in 1854, and it was in his second term of office that he died on 4"1 May 1880. In 1868 he had also 'been elected to the Aldermanic Bench', and in 1870 he was appointed a Justice of the Peace. He been 'ailing for some weeks, and intimated his intention of asking the Council to relieve him of the onerous duties of the Mayoralty. He was, however, advised to retire to Addlethorpe [House], in the hope that his health would be recruited, but unfortunately he gradually became worse, and died... ...on Tuesday.' So passed a colourful and very energetic character. In his will of20"1 September, 1878 T.J.N. stated that:- 4 desire that if I die at any place in the United Kingdom my body may be interred in the Lincoln Cemetery in the same grave with the body of my dear Wife [Christiana had died 7th October 1876] and I desire that my funeral shall take place with as little ceremony as possible and that no feathers hatbands scarfs pall or other mockeries of woe be used.' An unusual request for one who was said to have sought and gloried in the limelight during the 32 years he was in public life! But his desires would not be carried out as 'it was felt by the Corporation that as chief magistrate of the city the public ought to be allowed the opportunity of showing their respect for his memory, and after considerable pressure, the family consented that the funeral should be a public one.' The funeral took place on Saturday, May 8th, with the 'mournful' cortege leaving T.J.N. 's residence. Monk's Leys House [built in 1872] in Lindum Terrace, while Big Tom of the Cathedral tolled. The solemn procession consisted of the Lincoln Blue Coat boys with their band, the police, the hearse, the chief mourners and the City Magistrates in carriages, the Corporation bearing the regalia, the Deputy-Mayor and Sheriff, Town-Clerk and Deputy Town-Clerk, Aldermen, Councillors, and Corporation Officials, ail in carriages, followed by officers on foot, together with representatives of other public bodies. The route taken was down New Road, along Silver Street and High Street, down Portland Street, and along Canwick Road to the cemetery. The Christ's Hospital brassband played at intervals 'The Dead March', and nearly every shop in the city was closed as a mark of respect. This will of T.J.N. makes very interesting reading, other than his desire for a discreet funeral. As his wife Christiana had predeceased him it was up to him to dispose of the prized household objects, which, as a self-made man, were proudly acquired, and definitely not inherited. We read of a silver tea set, and a gilt time piece, both presented to him by John Hinde Palmer Q.C. ; an electro plated egg stand with egg cups and spoons; a presentation silver tankard; a pair of silver sauce ladles, and other numerous pieces of silver cutlery; an electro plated tea um, coffee pot and tortoiseshell tea caddy: an electro plated pickle stand with two glass pickle jars; all typical items in a middleclass mid-Victorian family. There were items of Christiana's jewellery left to the daughters, the drawing room threefold screen worked by Christiana to the second daughter Christiana Else, and the 'mahogany mace case which I had made to hold the City Regalia when I was Mayor in the years 1854 and 1855' to Thomas William his third but oldest surviving son. 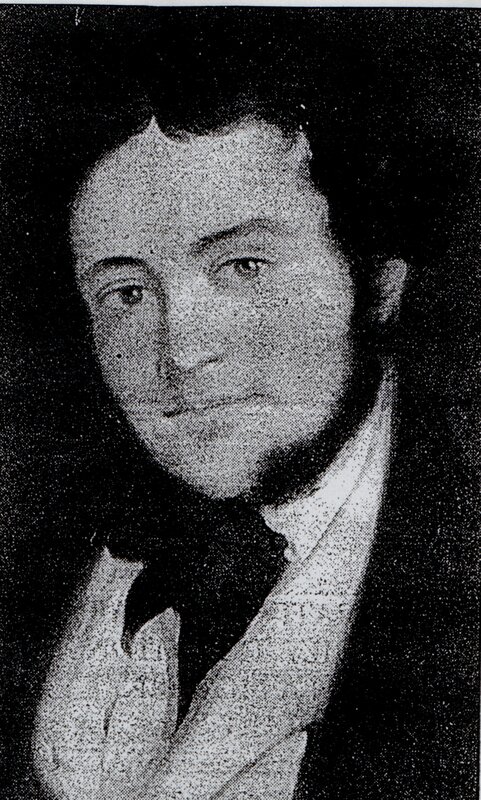 He bequeathed two family portraits, one of him and Christiana to Thomas William, and other, still in existence, of 'my likeness taken in oils by Mr Sam Tuke of Lincoln when I was twenty one years of age' to his youngest son Frederick Charles. This shows a confident young man, full of ambition, in the fashionable clothes of 1835. To Thomas John Harrowsmith, his grandson (son of John Ellett who had died in 1875) he left a set of electro plated cutlery (all grecian pattern) and 'my galvanic machine', what ever that was! The cutlery is still in the family, now in Canada. T.J.N. 's estate, when valued, came to under £7,000.